Competitive open water swimming at the highest levels combines the aerobic conditioning of running, the tactics of cycling, and the toughness of water polo (or boxing). Manny Pacquiao is one of the world's greatest boxers in history. Over the course of his career, he won world championships in seven different divisions and was the first boxer in history to win nine world titles in seven different weight divisions. One secret to his success: he incorporated swimming into his arduous training program. 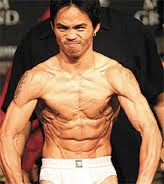 The Filipino politician and boxer, named Fighter of the Decade by the Boxing Writers Association of America, swam but not all was easy, "I swallowed a lot of water." The breath-taking conditioning of a marathon runner, the tactical brilliance of a chessmaster, the graceful efficiency of a rower, the courage of a big-wave surfer and the physical toughness of a boxer...that is the make-up of elite competitive open water swimmers at the highest levels.